In our previous post, we introduced you to Lodgical Solution’s HTML emails and how they can contribute to your property. Hopefully you have taken this opportunity and begun using these emails at your property! If not, read over our recent post, HTML Emails Part 1: How they can benefit your property, or call Bay Lakes Information Systems at 920.746.0606 to get started. In this post, we will show you how to edit and send your emails in Lodgical Solution. 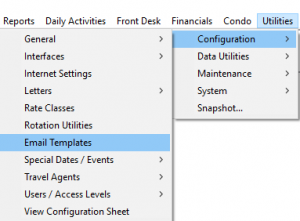 Click on Utilities, Configuration, then Email Templates. The Name section at the top is what it will be listed as in Lodgical. The Subject section will be the subject of the email when you send it to your guest(s). There are two ways to send your emails in Lodgical. They can be sent individually in each reservation. Otherwise, you can send a bulk HTML email message to guests arriving and departing on specific dates. From this window, you can select the template that you would like to send, preview, and/or send it. 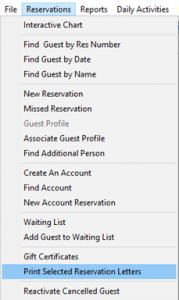 Click on Reservations, then Print Selected Reservation Letters. From this window, you can select your target guests and the template you would like to send. If you have any questions, contact Bay Lakes at 920.746.0606.